We will create a custom solution to fit your aspirations and resources, a cost effective website that becomes an asset to your business. In addition to Home, About and Contact your website can include features below. We can of course include any additional pages or features on request, please contact us to discuss. Respond positively to funeral plan enquiries by making sure people have the ability at their finger tips to get the information they want. We can integrate promotional videos to give you the best possible opportunity of converting website visitors into enquiries. Price is one of the most searched for terms on the internet. We'll help you to address this question on your website. Families no longer want to browse and choose from a printed catalogue. Allow them to select effortlessly from your online brochure. Allow families to choose a coffin from your online brochure wherever they are located. Build trust - The more people follow and share your content the more comfortable and familiar they become with your brand. Funeral Announcements are proving to be the most visited pages on a funeral director websites. We are experts in this field. Online donations help families to donate in the way they're familiar whilst raising more for good causes. You provide an exceptional service, build your reputation by allowing people to express this online. We will consult with you and offer advice regarding digital marketing of your business based upon our many years of working with funeral directors. Every website we build is unique combining features that we consider to be 'best practice' along with the individual preferences of each client. Many of our funeral director clients come to us with features they have in mind. We will provide just the right solution for your business whether you're a single branch start up business or a long established concern with several branches or anything in between. £25 Plus or £35 Premium per month Hosting, Maintenance and Support Fee - your website will be professionally hosted and maintained by us. Optional Much Loved integration included in cost. Email addresses can be included. If you would like more control of your website to make your own updates just let us know. If you would like to include additional pages or features please contact us. We provide package prices to give you a guide, we also understand that these packages may not be right for everyone. If you're a single branch start up business or a long established concern with several branches you might find these packages aren't what you need. If that's the case then speak to us, we can build just the right website for you. We offer an optional client feedback and review service which enables you to independently collect and display funeral reviews on your website. You can easily add all client feedback provided separately in letters, cards and emails, to also display on your website and keep content up to date. MuchLoved is dedicated to helping your families commemorate their loved one by creating a beautiful memorial website as a tribute. Much Loved are partners with a number of leading bereavement and support organisations including a wide range of charities, hospitals, hospices and funeral organisations. MuchLoved Announcements and Tributes can be integrated with your website to accept donations from visitors to a chosen charity. Give the very best impression of your business. 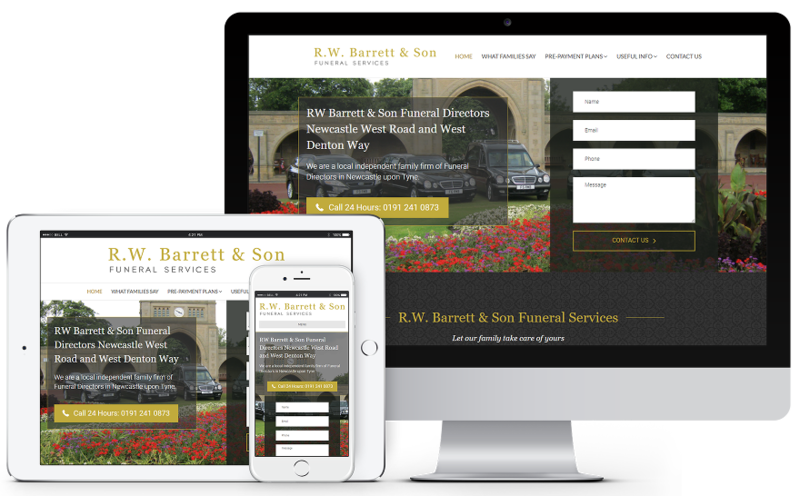 Funeral Directors Websites are an affordable solution for Independent Funeral Directors giving you a high quality online marketing tool for your business. Effective Social Networking features can be included plus Google local business set up to get more enquiries for your services. All websites include free initial domain name registration.